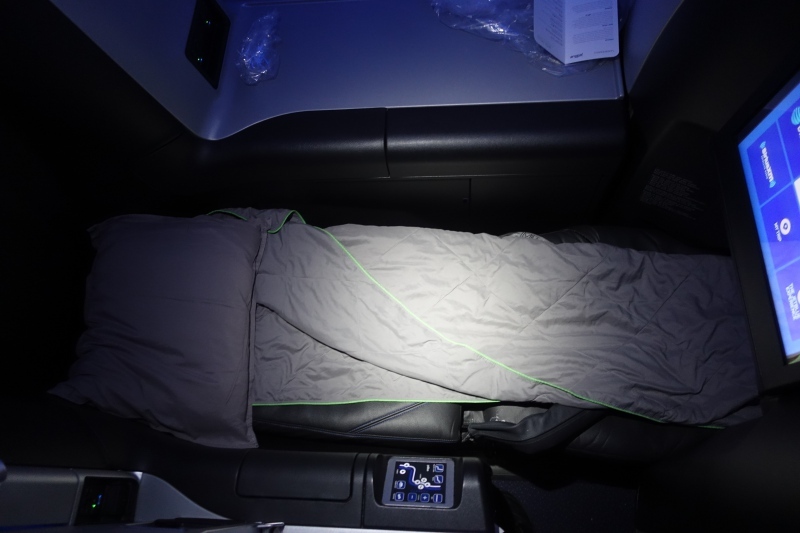 JetBlue Mint is JetBlue's flat bed business class product, available on trancontinental routes such as between NYC JFK and San Francisco SFO and JFK and LAX, but also other routes (see JetBlue Mint Expands to Seattle, San Diego, Las Vegas, Caribbean). 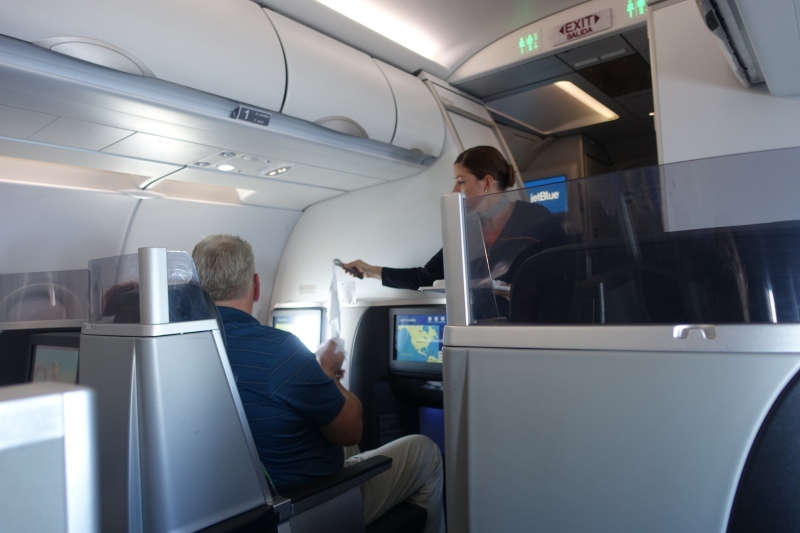 And while my husband has flown JetBlue Mint a few times, I just flew JetBlue Mint for the first time recently, on our way back from the West Coast. Here are 5 things I love about the product and a couple that I don't. Generally, due to award availability, we book our trips about 10-11 months in advance. JetBlue's booking calendar opens 9 months in advance, and if you're booking soon after the calendar opens, you generally have your pick of Mint seats, including the 4 solo seats that have extra space around them and a closing suite door. While the suite door isn't high, it does add a measure or privacy when you're resting or sleeping, and I especially welcomed the extra space on the right where I could place my computer and bag when dining. And from JetBlue's perspective, it's a nice way to reward early bookers, enabling them to select a more private seating option as long as they book early. I find JetBlue to have some of the best and friendliest service, even in economy, of any U.S. airline, and Mint is no exception. There were even handsigned cards placed on our seats welcoming us, and service continued to be attentive and friendly throughout the flight, from the pre-flight drink, hot towel before the meal as well as hot towel prior to landing, appetizer, meal service, and keeping my hot tea refilled. While I have one complaint that I'll get to below, on the whole this is one of the 2-3 most comfortable seats I've flown in for domestic U.S. travel, the others being American A321 Transcon Business Class and American A321 Transcon First Class. 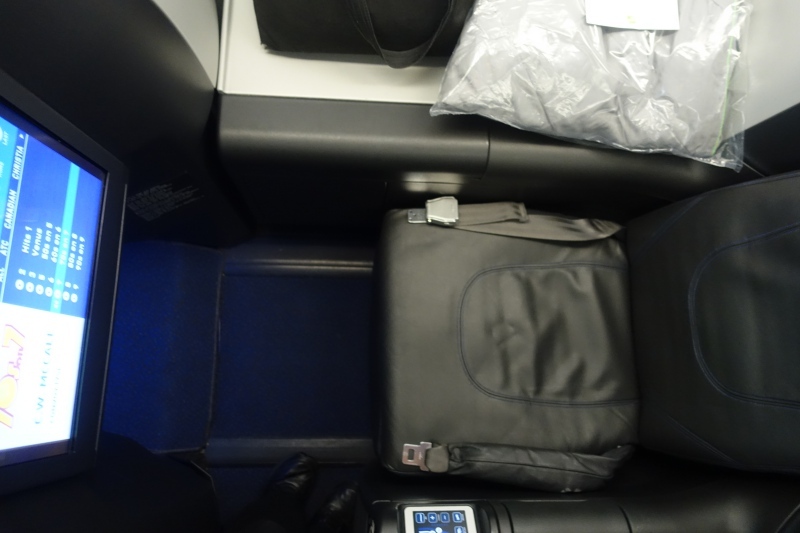 The recliner domestic first class seats I've flown on have been awfully uncomfortable, even for short 2-3 hour flights (see Review: American Airlines Old A321 First Class with Recliner Seats and Alaska Airlines First Class Review). The JetBlue seat can easily be reclined into a very comfortable “Relax” position, or all the way into a flat bed, and comes with a comforter and pillow. 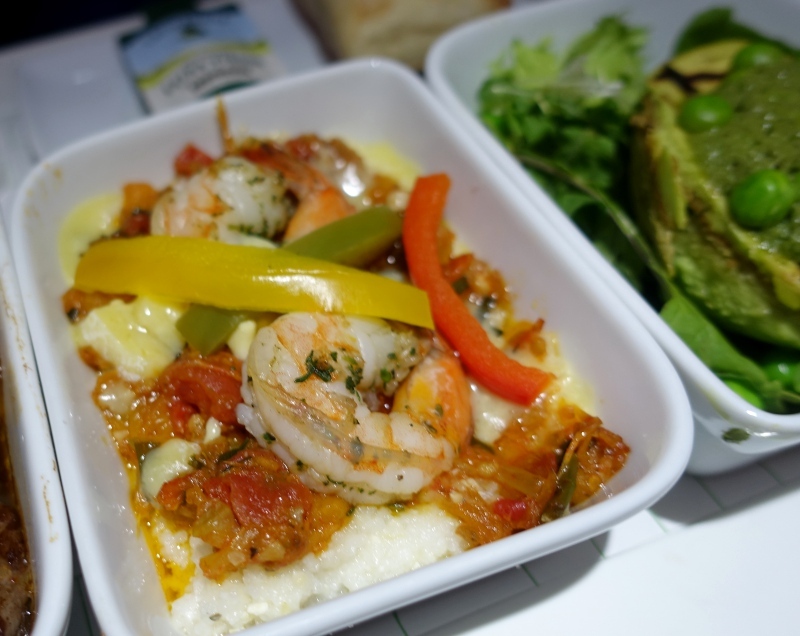 JetBlue partners with Saxon + Parole, an NYC-based new American eatery, for its menu, which changes monthly. My son and I especially liked the Shrimp & grits dish, with its piquant tomato ragout balanced by creamy mascarpone and cheddar cheese, and my favorite was a Saxon & Parole signature dish, Grilled avocado with salsa verde, although I found the Ribeye steak bland and tough. The nice thing about JetBlue pricing is that it's based on one way flights, so there's no penalty for booking a one way. That's handy if you've used award miles for the other part of your trip, and just need a one way positioning flight for your outbound, or, as in our case, a one way flight at the end of your trip. The lowest price I've seen recently for a one way JetBlue flight between SFO and JFK is $659 (typically for early morning flights that are otherwise hard to fill) and a more usual price is $859. American, on the other hand, does charge more than half the cost of a roundtrip for a one way, so for example if you find a sample roundtrip fare of $1951 for its A321 flat bed business class JFK-SFO-JFK, one way will be $1059, a good $200 higher than JetBlue's pricing for most of its flights, and $400 higher than JetBlue's lowest fare of $659. And keep in mind that this price is for AA's Business Class product, whereas if you book early, you can book a JetBlue Mint suite for no extra cost. I found the American A321 Transcon business class bed to be slightly more comfortable in terms of its padding and being completely flat, unlike the JetBlue bed which even when fully reclined seemed to be at a very slight angle, and a bit firmer. Using the comforter as a mattress pad helps somewhat, but I doubt I'd ever be able to get real sleep on it. I also found it awkward in terms of how narrow it was, which meant I didn't have anywhere to rest my arms when lying down. Fortunately, while we were on a night flight, it wasn't a red eye, so I didn't need to sleep. JetBlue's agressive pricing strategy for Mint means it can't afford to invest in lounges for Mint passengers. That was ok for us in San Francisco, where we made use of the AMEX Centurion Lounge, but if you don't have a card giving you complimentary lounge access, it's a difference from flying a legacy airline's business class, where you'd have access to a lounge, handy in the case of delays, such as our 2.5 hour delay when departing SFO. 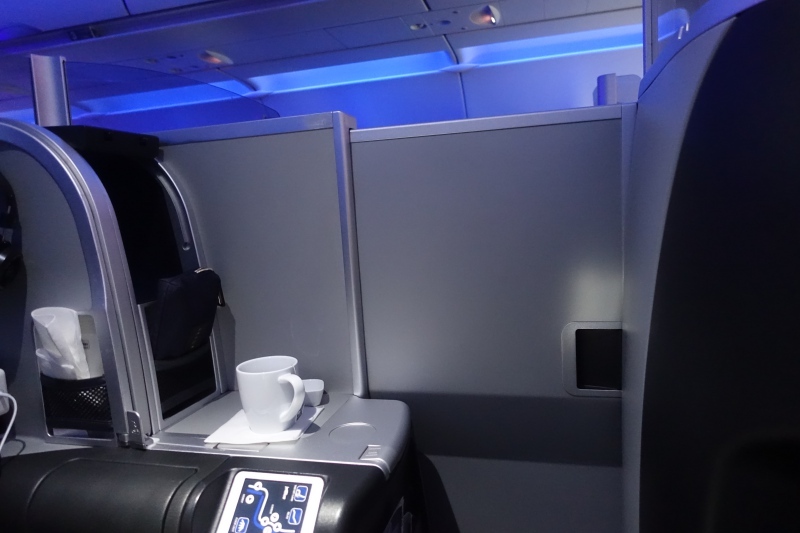 What do you like or not like about JetBlue Mint? New JetBlue Credit Cards Worth It?